In complement to my blog post regarding Facebook, Twitter and Apple victims of a watering hole attacks, you will find here under some additional informations regarding OSX/Pintsized, the backdoor used to in these attacks. F-Secure also reported, the 19 February, some additional C&C servers “cloudbox-storage.com” and “digitalinsight-ltd.com“. Symantec reported some additional details on the C&C domain names “cache.cloudbox-storage.com“, “img.digitalinsight-ltd.com” and “pop.digitalinsight-ltd.com“, and also reported the storage location of the forked version of OpenSSH “/Users/[USER NAME]/.cups/cupsd“. All files, targeting OSX, were controlled by launchd daemon through launchd.plist configuration files. Here under the list of all known launchd configuration files. Here under all binary files, aka “/Users/[USER NAME]/.cups/cupsd” or “/usr/sbin/muxd“. Fork of OpenSSH_6.0 with no logging, and “-P” and “-z” hidden command arguments. “PuffySSH_5.8p1” string. 2048 bit embedded private key with associated public key. Fork of OpenSSH_6.0p1 with no logging, and “-P” and “-z” hidden command arguments. “PuffySSH_5.8p1” string. 2048 bit embedded private key with associated public key. Here under an additional binary caught when Microsoft also pointed the fact that they were victim of this campaign. 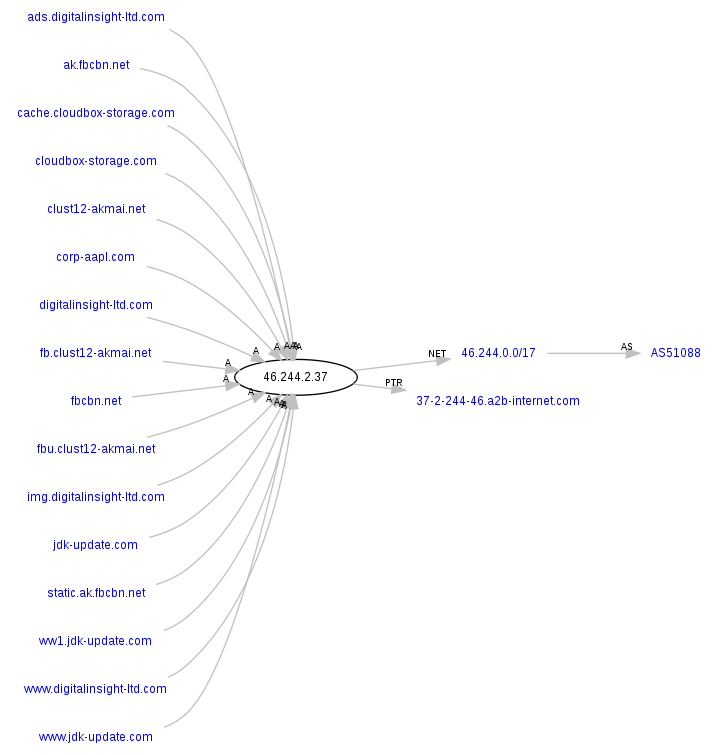 If you take a look at all the domain names sinkholed to Shadowserver, you will see additional domain names. RT @jedisct1: OSX/Pintsized Backdoor Additional Details http://t.co/QzO4yCqQW4 <- The one that got Apple, interesting analysis.